Ivara of Olenveld is a hostile Nord necromancer hailing from the island of Olenveld off the coast of Skyrim. 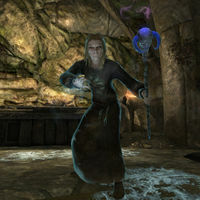 She can be found within Brittleshin Pass during the related quest, taking the place of the usual dungeon boss. Ivara wears necromancer robes and boots. In combat, she wields the Staff of Hasedoki and an enchanted dagger. She carries an alchemy ingredient, her notes, as well as the books The Light and the Dark and Souls, Black and White. You will need to kill her and her companion Lushak gra-Ragdam during the related quest.